HITEC City was commissioned by Larsen and Toubro Limited through its Special Purpose Vehicle, L&T Hitech City Limited, a joint venture company of L&T Infocity Limited and erstwhile Andhra Pradesh Industrial Infrastructure Corporation. The project is spread over 300 acres (120 ha) of land and was envisaged to develop 11,000,000 sq ft (1,000,000 m2). of IT space and 4,500,000 sq ft (420,000 m2). of residential space in a phased manner. The Project offers multitenanted as well as Built-to-suit (BTS) facilities. It caters to all segments of the IT Industry including small & medium enterprises, with office areas starting from as small as 2,500 sq ft (230 m2). The project was initiated by APIIC with participation of private infrastructure companies like L&T, Raheja corporation, Ascendas IT Park, Vanenburg Corporation, Peepul Capital (successor to iLabs Venture Capital Fund), SP, RMZ corporation, Divyasree infrastructure, Lancohills technology park, DLF, Emaar MGF and others. 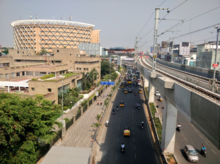 The area comprises IT parks such as L&T Infocity, Hitech City2 SEZ, Vanenburg IT Park or The V, Mindspace Cyberabad SEZ, DLF IT SEZ, Tech Mahindra IT SEZ, TCS Synergy park IT SEZ, SEZs of Infosys, Wipro and APIIC, built to suit campuses of several major technology companies. Cyber Towers is the first phase of HITEC City and was inaugurated by Foundation stone laid for Cyber Towers, Hyderabad in 1991 by AP CM Nedurumalli Janardhan Reddy. At that time Indian Prime Minister was PV Narasimha Rao. Later on Cyber Towers is the initial phase of HI-TEC City and was inaugurated by Atal Bihari Vajpayee and Chandrababu Naidu in November 1998. This was the first tower to be built for promotion of Information Technology (IT) and it was initially marketed by both the officials of APIIC and L&T Infocity Ltd (the public and private sector partner). Companies such as Orbees Business Solutions, Knowledge Matrix India Pvt Ltd., 7 Hills Business Solutions, AppLabs, NTT DATA, Microsoft, Patni Computer Systems, Oracle Corporation, GE Capital, WHISHWORKS, Prithvi Information Solutions, Naia Software Solutions India Pvt Ltd., Four Soft operate and call centers operate from this four-quadrant, 10-story building. The Cyber Towers building is divided into four quadrants with a large fountain in the middle of the quadrants. Laxmi Cyber City, built in 2007 consists of three blocks. A block- HSBC GLT B block- E&Y, Inventiv, etc. C block- ADP The property is close to 1 Million sft. and shares its heritage with Laxmi Cyber Centre (Banjara Hills), Laxmi CentrePoint (Begumpet GE), Laxmi Cyber Point, Laxmi Cyber Towers SEZ etc. Infocity is the first software technology park layout in HITEC CITY which attracted major technology companies like Accenture, Microsoft, Oracle, s2Tech Technologies etc. Hyderabad International Convention Center was built by Emaar MGF of India. The company is part owned by Emaar of UAE. The facility is managed by Accor Hospitality. The Hyderabad International Convention Center with 5,000 seating capacity is India's largest convention facility. It is an integrated 291,000 square foot (27,000 m²) facility with a 287-room-capacity business hotel, Novotel Hyderabad, covering 15 acres (6 ha). The center can be configured to increase seating capacity to about 6,500. Hyderabad International Trade Expositions Limited (HITEX) is a venue for international exhibitions, conferences, trade shows, and corporate events in India. It was conceptualized by German architects and inaugurated on 14 January 2003 by Commerce Minister Arun Shourie, and the Trade Fair Office Building by Andhra Pradesh former Chief Minister Chandrababu Naidu. HITEX is located at Madhapur (near HITEC City). The facility is spread over nearly 100 acres (40 ha). GITEX Hyderabad, is the annual IT&C expo organized by the Dubai World Trade Center in association with the Department of IT&C, Government of Andhra Pradesh. CII-Sohrabji Godrej Green Business Centre (CII-Godrej GBC) was established in the year 2004, as CII's Developmental Institute on Green Practices & Businesses, aimed at offering advisory services on conservation of natural resources. The Green Business Centre was inaugurated by His Excellency Dr. A. P. J. Abdul Kalam, the then President of India on 14 July 2004. The Services of Green Business Centre include- Energy Management, Green Buildings, Green Companies, Renewable Energy, GHG Inventorization, Green Product Certification, Waste Management and Cleaner Production Process. The Mindspace IT Park includes residential, recreational, entertainment, and retail spaces. The park provides about 4,000,000 square feet (370,000 m2) of office space. Spread across 110 acres (45 ha), this layout also provides about 40% open space with telecommunications and civic infrastructure, wide roads, and greenery. The district witnessed immediate success with over a million square feet built and occupied within just 14 months of starting the project. The park provides both multitenant and built to suit facilities. Companies such as Hyundai Mobis, IBM, Accenture, CSC, Bank of America, Facebook and Novartis have built to suit facilities in the park with 10000 workers within them. Other companies in multitenant facilities include Broadcom, Deloitte, Parexel, Syneos Health, Qualcomm, Zensar Technologies Ltd, Tech Mahindra, Oracle, Accenture, Amazon, General Electric, OpenText Corporation, Patni Computer Systems, Verizon, Thomson Reuters, Wellsfargo and Tieto. As of 2008 March, 20,000 people work in the park. The park is a notified SEZ and is set to accommodate about 55,000 IT workers making it the largest of the IT parks in HITEC CITY. The park also has a Westin Hotel and Inorbit Mall which have been opened in the second half of 2009. Hitec City-2 is a milestone project of Phoenix Infocity Pvt. Ltd. This is a venture by Phoenix Group, India. Hitec City-2 is an IT/ITeS Special Economic Zone (SEZ), and it is being promoted as an extension of Hitec City. The project has received formal approval as an IT/ITeS SEZ from the Ministry of Commerce, Government of India. On an overall builtup area of about 3,000,000 sq ft (280,000 m2), nine IT buildings are proposed with a mix of multi-tenant and customise-built to suit options to be developed in phases. The SEZ design allows about 28,000 IT workers to work in an area of 3,000,000 sq ft (280,000 m2). ^ "Hyderabad: Colossal Gloss in City of Boom". ^ "Emaar MGF". Emaar MGF. Retrieved 24 November 2011. ^ "list of Auditoriums in hyderabad". hyderabad-best.com. Retrieved 24 November 2011. ^ "Hyderabad International Trade Expositions Limited". HITEX. Retrieved 24 November 2011. ^ "GITEX Hyderabad". GITEX Hyderabad. Retrieved 24 November 2011. Wikimedia Commons has media related to HITEC City.